People all over the globe are being connected by the internet everyday, creating new relationships and culture. The internet is the creation of a new society and our thoughts and actions are impacting the society positively or negatively. The Sunfull Internet Peace Movement is a movement to encourage your positive thoughts (Good Heart), to find good words (Good Comments), to use them (Good Practice) and to promote this positive motivation to others (Promote Positivity). By spreading the positivity, we can create a more harmonized positive online culture. The Internet Peace Prize medal represents these four core values of the Sunfull Internet Peace Movement; The Good Heart, Good Comments, Good Practice and the Promotion of Positivity. G. BRAND (Designer Seo Whan Kim) has designed the Internet Peace Prize medal being inspired by the four values of the Sunfull Movement and emphasizes 'harmony' as the main concept. The representing colors of each value has been extracted from the natural color gradients of the sun and sunflower. Designing the four concepts into a geometrical vortex, the medal symbolizes the harmonized internet society driven by the four values represented in four distinct colors. The Internet Peace Prize medal is in the form of a circle to represent a continuous effort to develop a positive reinforcement of a harmonious relationship between people. Each side embodies the harmonious vortex representing the four main values of the Sunfull Internet Peace Movement. 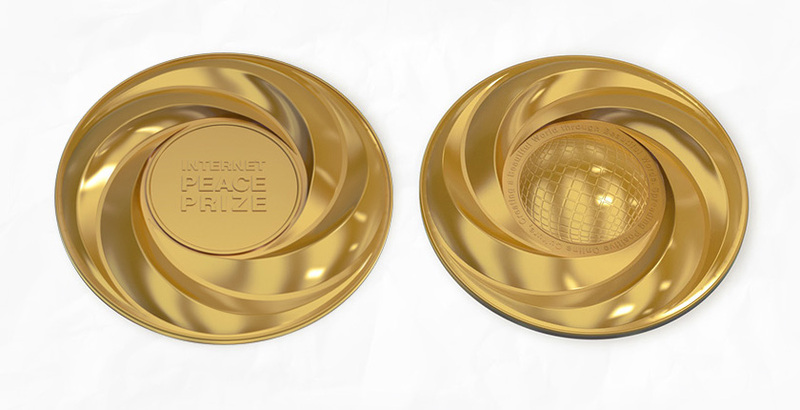 On the front side, the honorable name of the Internet Peace Prize Laureate is engraved on the center. On the back, a framework pattern of spaced bars symbolizes the seed grid at the center of the sunflower and the globally connected network, meaning the global expansion of the Sunfull Internet Peace Movement. The phrase wrapping around the edges of the framework, indicates the purpose of the Sunfull Movement as ‘Spreading Positive Online Culture, Creating a Beautiful World through Beautiful Words’.